Rezdy’s resource dependant calendar simplifies resource management and allows you to maximise the use of your resources while avoiding overbooking. Here’s everything you need to know about resource management in Rezdy. A resource is an item such as a vehicle (Bus, Boat, Car, Helicopter), a person (Guide, Instructor, Driver), a venue, etc., that can be assigned to your Products to manage your availability or your roster. Rezdy’s booking software allows you to link Resources to Sessions so that your availability is updated based on your Resource’s availability. This is what we call a “resource dependent calendar.” It becomes powerful when you have more than one Resource required for a Session, or when Resources are shared between concurrent Sessions and Products. The benefits are that your customers cannot overbook when your Resources become fully booked. In addition, proper resource management maximizes their occupancy so you don’t have resources sitting idle. How can you use resources? Here are a few examples of how Resources can be applied. If you are interested in setting up Resources such as your guides, instructors or even your vehicles for the sole purpose of assigning them to days and times for a roster, then you would set up a Resource as Non-Limited – which means that there is no availability associated with the Resource and you can assign them to a Session at will. A limited Resource is one that have a defined availability. 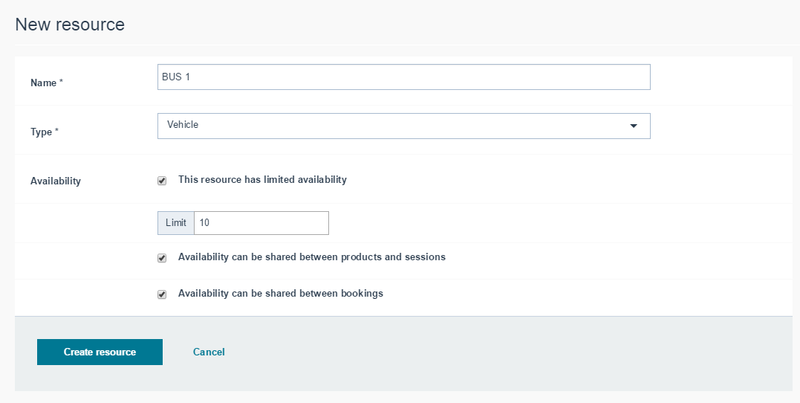 A shared Resource is one that can accept booking from multiple Products. This is useful in that is will allow you to maximize occupancy without overbooking. For example, if you run a Bike shop and you have 10 bikes which can either be used for a Guided Tour or Hired, you would create a Resource with a Limited availability of 10 while also keeping it as a Shared Resource. This way the Resource can be assigned to both your Guided Tour and Hire products in your Calendar so that when a booking is made, the availability for both Products will be decreased simultaneously. This is useful in that is will allow you to schedule multiple Products at the same time (so as to optimize availability to your customers) without overbooking. For example, if you offer both a Group Tour and Private Tour but only have 1 bus or boat or vehicle with which to run the Tour, you would be able to schedule both with the same Resource and then whichever tour got booked in first would be confirmed and the Product which was not booked would not longer be available/open for bookings. How can you create a resource? It’s a 5 step easy process to create your resource. Simply head to Inventory > My Resources > New resource. Click here for full setup instructions. You can also easily modify your resource. How can you assign resources? Once you’ve created your resource, all you have to do is head to your calendar to assign them to sessions accordingly. How can you use both fixed availability and resources? One of the most powerful tools within Rezdy is the ability to manage your availability by both Fixed Availability and Resources. The reason you would use both, for instance, would be if you wanted to limit the number of bookings for one Product but still decrease the availability (linked by the Resource) of another Product. For example, if you have Bikes (your Resource) which are used for a Guided Tour and also for Hire but you wanted to limit the number of Bikes that can be used for Hire at a given time (so as, perhaps, not to take too many away from the Guided Tour) you could set a Fixed Availability to your Hire within that Session in your Calendar. Click here for instructions on how to use both fixed and resource-based availability.